Been a while since I've posted on here having been distracted for some years with full size car projects, house maintenance and family - but now I am finding a bit of time again. I've recently picked up my tools again, started a 57 Black Widow Chevy, built a couple of planes, then got back into cars again. 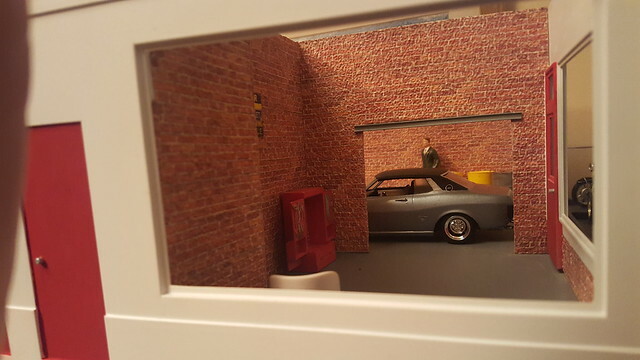 Now I fancied doing a Diorama, and a garage seemd logicial. So, here it is so far. I started with the "Joe's Power Plus" set up. 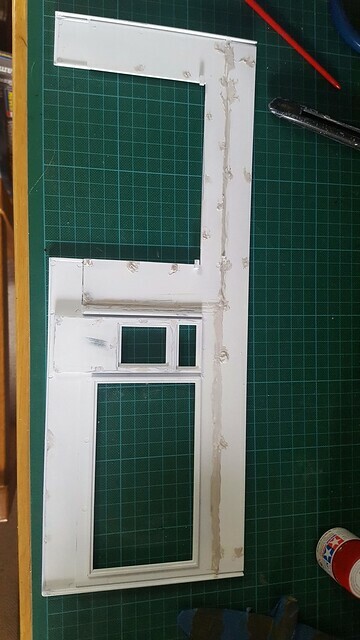 My plan is to modify it so it is a complete building and then customise the internals and externals (a bit) to be a unique speed shop. 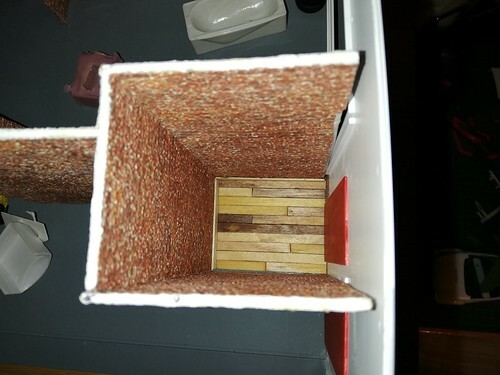 I started dry building it (without glue). 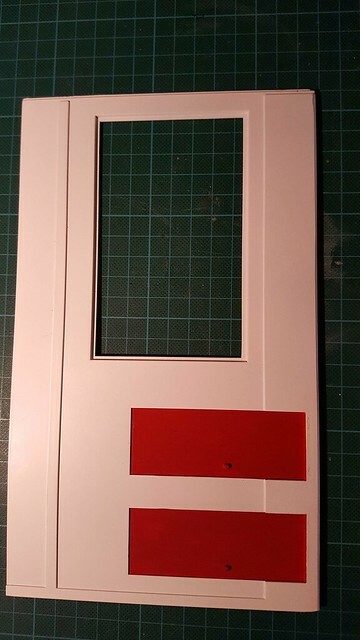 The panels were quite distorted and warped so tape was required during assembly. Injector points on the inner surface were filled along with the join lines. I tried to keep the filling work minimal purely because I dont want the building perfect, and I want a few bulges and marks on the walls. I know the edges aren't perfect. A bit of an update for you. I've carried on trying to detail the garage and give it a rustic theme. 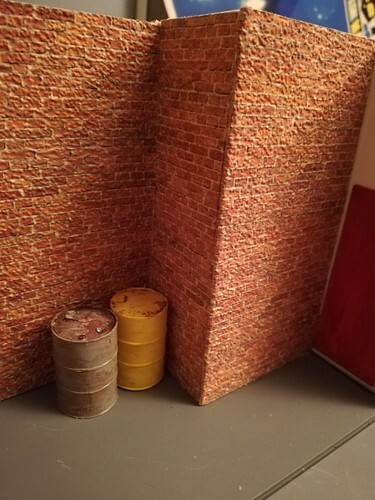 I purchased some 3D printed brick and have started adding it to the lower section on the inside to try and give more depth to the sections, and show an area not rendered. And this is the first painted dry fit. A lot of fiddling to get the sides to fit in the grooves. 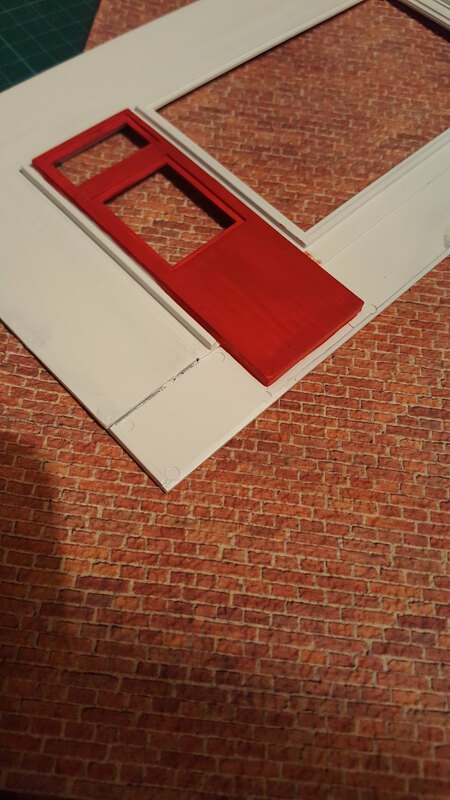 I opened the channels up slightly and also had to file the the lower ends of the walls into a "V" prior to paint to fit. Just goes to show it doesn't always go right. Started touching back in and it will get better especially once weathered and there are some features outside. G'day jamese. I like what you're doing here and will be following along, I'm sure your whole diorama will evolve and change as you progress. Good stuff. Cheers. 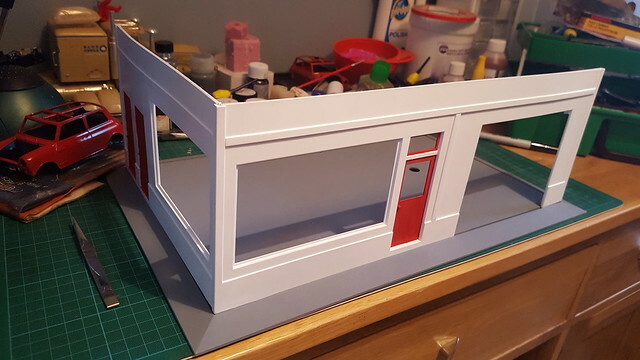 It's slow progress and my first diorama building so learning as I go along! 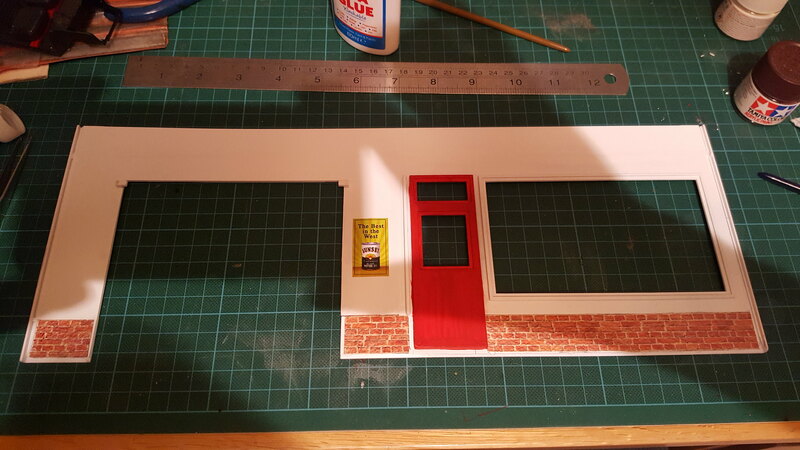 It's slow progress and my first building diorama for a while - I did some Ho/00 scale when i was a kid, so I'm learning as I go along! A bit more of an update. 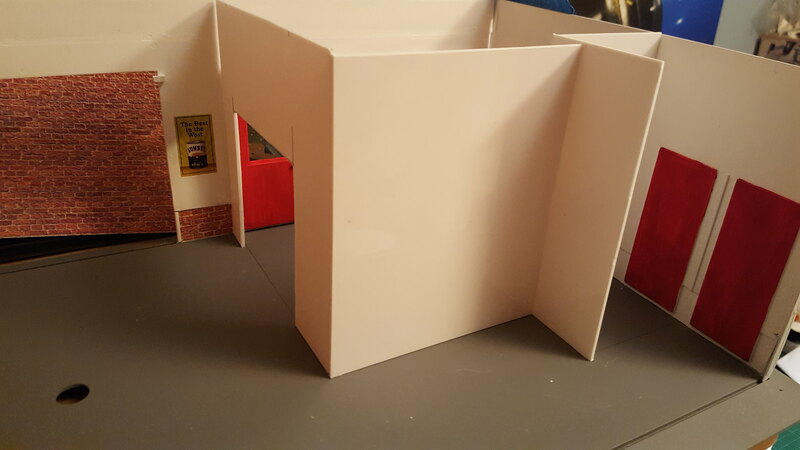 I started out making the internal walls with styrene sheet to the layout I wanted. Once happy with this I have started applying the 3D brick paper which is excellent stuff and comes out really well. I just have to start adding some more detail now for realism before finishing the external walls. I'm not too bothered about the gapping on the left as their will be a separate floor in there butting up to the wall if it goes to plan!?!? Hello, looks like you're off to a good start. I have the same model and will get to it at some point. I like all the tools and other bits that come with it. I used to deliver auto parts to a Gulf station back in '86, looked just like the model. Long gone. There are none of these stations left in my part of the world. Anyway, good luck with your project. I will be watching this space. Now, I work on model rail scenery at the Museum where I am on the board and Vice president of Modeling and Displays. I have NEVER seen that building kit before .Where did you get it ? O.C.G. Firstly, Old Car Guy, - the kit is available through several outlets. I got mine on ebay, but you can find it on amazon - if you google the kit name, in the title, you will find it. It comes with lots of accessories but disappointingly it at some point as had the RH and Rear walls removed and replaced with clear perspex. I have left the rear wall removable for photographing. 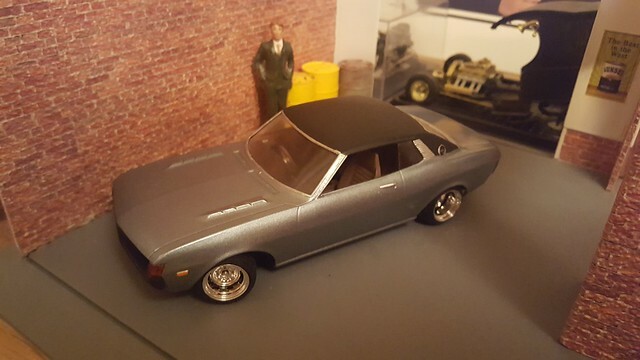 Apologies for the delayed update but I got distracted making my first "tuner/drift car".... The floor is now in courtesy of some cut down and stained wooden sitrring sticks... 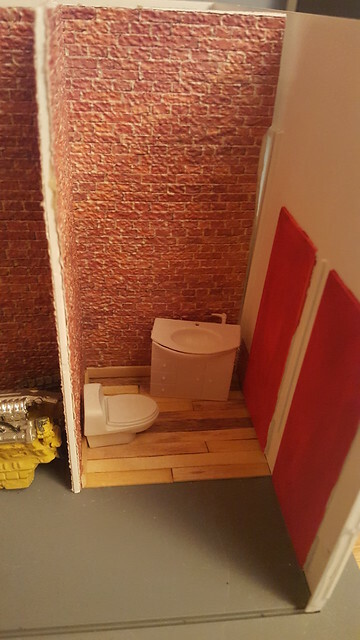 I bought a toilet and sink 1/24 scale?!? from ebay but the toilet is slightly too small and a bit too modern so will need some work. 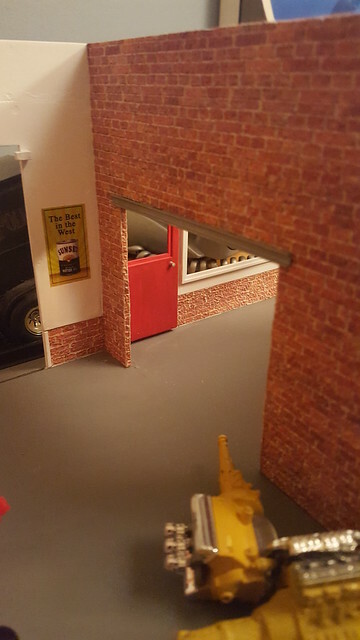 Work on the front "shop" part continues, and I have added a lintel over the entrance to the main workshop, with the plan being the shop could double up as a showroom for bikes or a small car (like a Mini). My "tuner" Toyota in the main workshop. This last image gives you an idea of how much room there is in the main workshop and the Toyota. Just enough room for two cars parked close, although once the ramp is in this will be restricted to one car. Thats all for now... will get back to the workbench. Hi James from "Sunny Brighton " . Love this thread …great looking set up with all those motors etc. & the sweet early Celica too ! 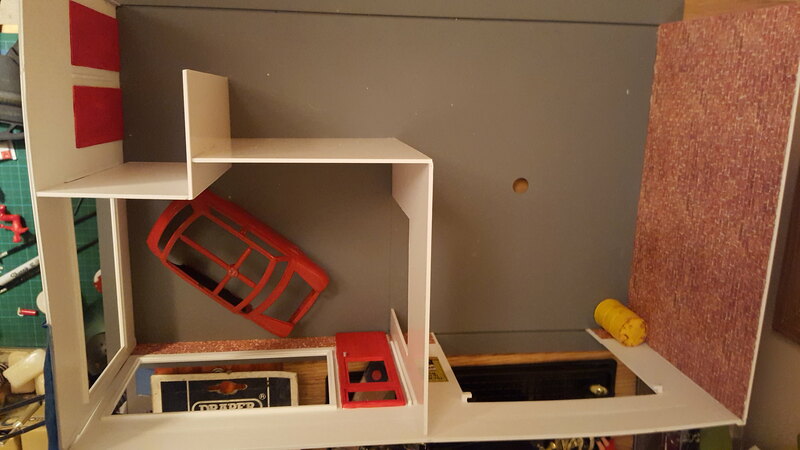 I've been doing a couple of scale dioramas for 1:64 & 1:24/5 cars for some time . Just need more space or even smaller scale stuff . Have a look on pintrest at some of the amazing ideas . Ice lolly sticks never looked so good ……. 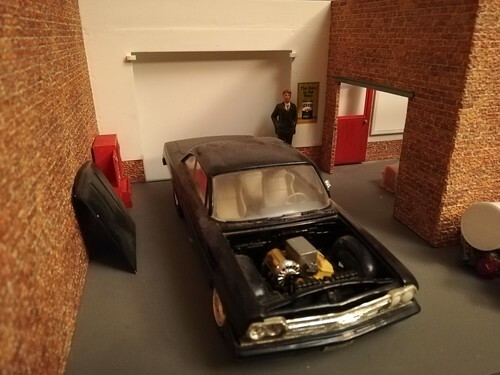 The garage is looking good, James. The brick work looks quite authentic. I've been wanting to do a dio for years, likely a garage project, so I'll be watching along as you work this project. Lookin' good so far James. If you're interested I found a toilet that might fit what you're wanting. 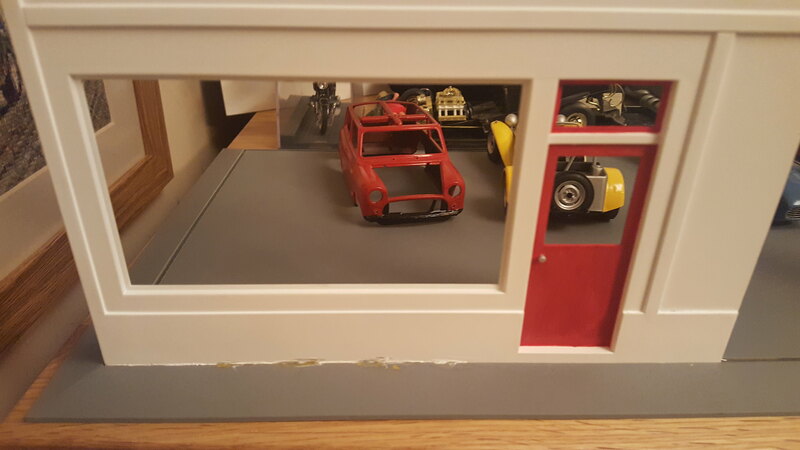 Apologies for the tardy response and updates but have been somewhat distracted with work, a couple of plane and lego projects for my son and a salt lake racer ’69 Camaro I bought as a partly glued together wreck on ebay (which was actually in a lot worse state than it looked in the photos on advert!!). Work is continuing slowly and I have been making an internal wall for the toilet area. Joe, thanks for your pointers on the toilet – that site is really good and I nearly ordered loads of bits until I realised the shipping cost to the UK (I think a full size toilet would be cheaper), so it’s back to the drawing board – I might just add some filler to the one I have to bolster it up, because as it stands I’m not happy with the scale. When its worthy of more images I will post them accordingly. Well, after quite a few distractions I have moved the job on a little bit. 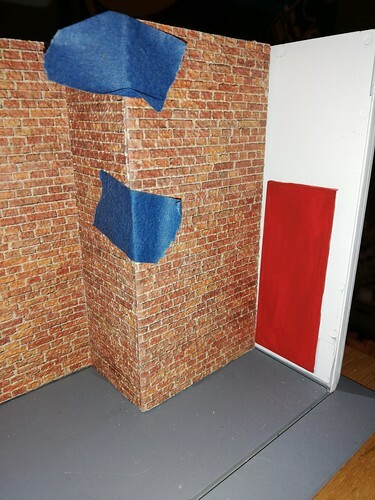 I have fitted the second and final wall to the WC and the iamge shows how distorted the Powerplus side wall is from the kit. 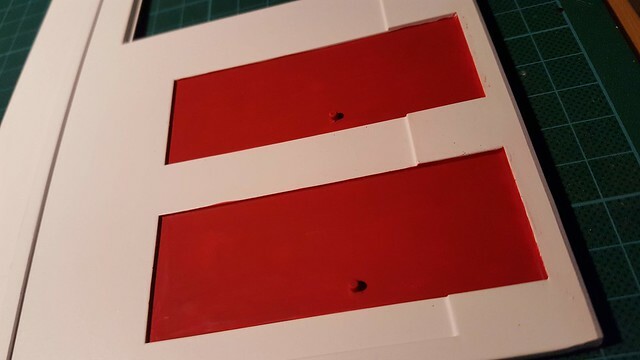 I am confident this will be resolved once the side is glued on, which I'm yet to do. The rest of the work has just been getting corners and edges squared off. 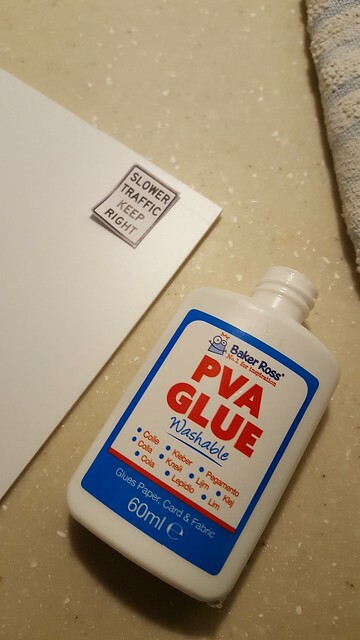 Tape removed and glue set! 3rd times the charm James ! 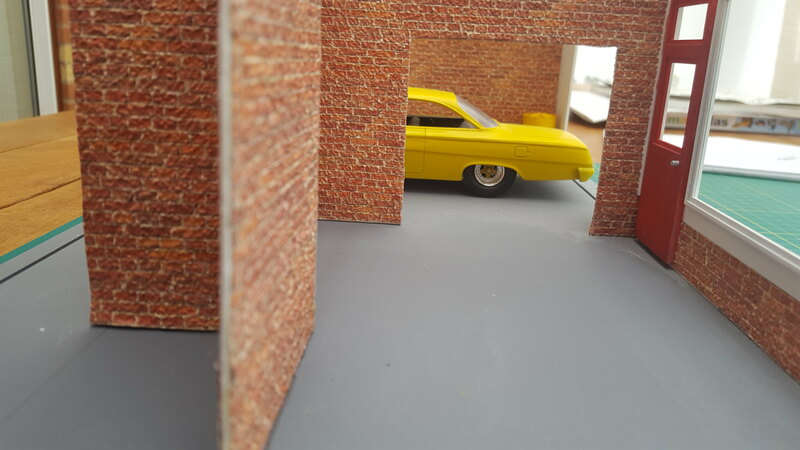 Dio's coming on well & I like that bubbletop Impala a lot . Time I updated my " Ol' Reliable 2 " 409 s/s kit I think . Yours looks rather sinister in black . & just noticed the yellow one too ! For dio parts have you tried 'hiroboy.com' in the UK . Sorry about that Spencer... I was having trouble getting the images pasted in and I think all the toggling back and forth messed things up. Ive cleared one post and hopefully will be able to delete the other one! I love the bubble tops - that one is actually a really dark blue, although not clear in the pictures. I have a about 3 others part made too that I need to finish.... A local model shop many years ago had loads of them and.couldnt sell them. I think I paid about £4 each for numerous Ol' Reliable and Don Nicholson variants and the road version. I've had a look at Hiroboy... I've got most of the garage kit already so I didn't look too long to avoid lightening my wallet but I think I'm going to have to find somewhere in the UK that will help me kit out the WC. If not I may scratch build. Don't laugh ....... THAT'S IT !! It's definitely.... Unique . 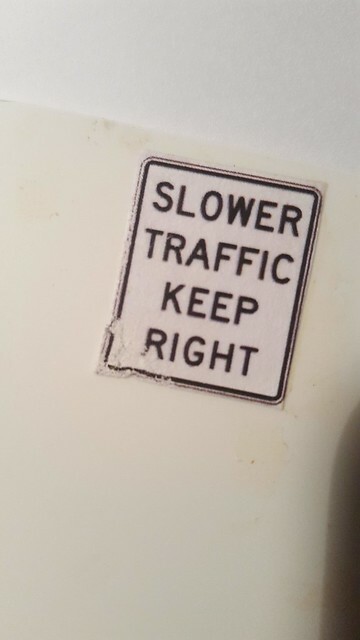 Thank you for the pointer though. 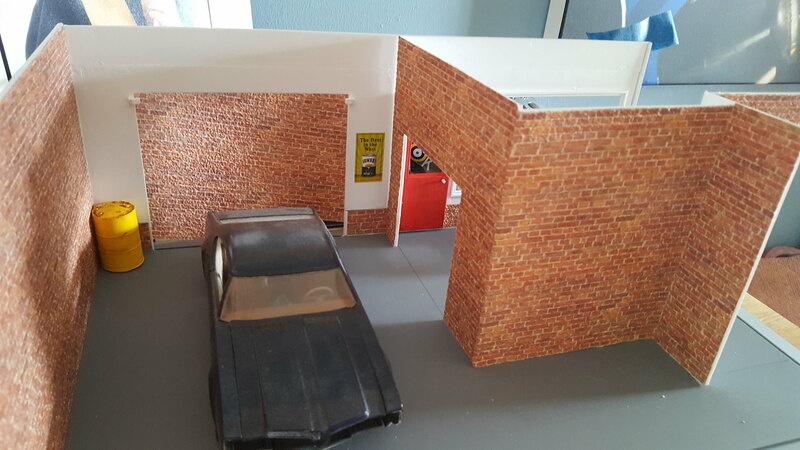 I should probably focus on the main garage bit first and try making it look more real and less sterile. Maybe a careful bit of weathering and more tools!